“Can you imagine what that gold could do to help my people? There are films you can compare with a richly filled five-course dinner. First, they spoil you with a tasty opener. After which a well-filled middle piece is offered. And then as an enjoyment afterward, you’re offered a delicious dessert. Satisfied you’ll leave the establishment and you’ll remember this treat with great pleasure. Other films are like a cozy family picnic. It’s relaxed and pleasant. No extensive preparations are necessary. And when you look back on it, you think of the coziness and life values. 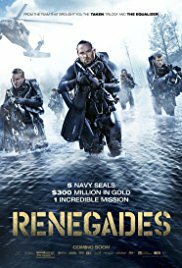 “Renegades” is like the McDonald’s. You are served very quickly. You’re eating it as quickly as possible (it’s fast food, remember). And before you know it you’ve already forgotten what you have eaten and hungry again. J.K. Simmons steals no gold, but the show. There’s also something positive to say about this film. The short performance of J.K. Simmons, acting in the same way as when he scolded his students as a music teacher in “Whiplash“, is magnificent. And the underwater footage in the second half of the film looks beautiful. And finally, the Bosnian girl (in real life the Dutch actress Sylvia Hoeks) is a pleasure to watch. If I had to choose between her and a nice dish filled with cevapcici, I knew what I would take. Quite obvious that she can convince a group of American Navy Seals to dive for a Nazi treasure in a lake in Bosnia. Or was it the gold bar that did it? This is what I call popcorn fodder. Although this film is of the same level as that of an average television film, it’s entertaining enough full of action-packed scenes and with a feel-good ending. The fragment with the tank is pure enjoyment. It looked like a modern episode of “The A-Team” with MacGyver in it for some assistance. I’m sure nobody would even know about this movie if they had left out the well-known actors. But at least it would have been a little less expensive and the turnover would have been more positive. If you have a package of popcorn laying around and a little time to kill, this film is definitely worth it. But just like with the MacDonald menu, the next day you can’t even remember what it was about anyway.